Perfection may have its limits, but Mercedes-Benz believes otherwise and proves it with the latest iteration of its flagship 4-seat coupe. The 2013 mercedes benz cl class electric vehicle qualifies for a federal tax credit of up to $7,500, effectively reducing the net base price. With aggressive styling, highly assertive engines, luxurious interiors, and endless customization available, the 4-seat 2013 Mercedes-Benz CL-Class coupes succeed in establishing themselves as the thinking and (very well-to-do) working man's high-end transportation. From the base CL550 Coupe to the 621-horsepower biturbo V12-equipped CL65 AMG, the CL-Class coupes offer a fine mix of performance and livability. But more important, their unmistakable presence and prestige makes a powerful statement about their owners while standing out among other automobiles, even in their lofty price range. If you've got it, don't feel a need to flaunt it, but occasionally like to take it for a run, the 2013 Mercedes-Benz CL-Class coupes give you all that you can handle plus a beautiful place to be meanwhile. If you dread setting up a new computer, TV, or any electronic device, the COMAND system might send a chill down your spine. The owner's manual runs over 700 pages. Saying COMAND takes some setting up is an understatement. For 2013, a new Grand Edition trim package is available on the CL550, including 20-inch wheels, AMG-inspired styling touches and a selection of special "designo" interior and exterior color schemes. The next-generation mbrace2 telematics with Internet-based features is also provided. Through its COMAND system, a 2013 Mercedes-Benz CL-Class coupe can be set up for any driver's preferences on seating and climate control as well as audio, communication and navigation systems management. The new version includes many Internet-based functions with smartphone control. All that is part of the CL driving experience, but only a part. Even the "base" CL550, with its 429 horsepower and Airmatic suspension, provides a dynamic, responsive and well controlled drive. But the higher-power engines and Active Body Control suspension on the other CL models can feel almost magical, with great thrust, control and comfort. The paddle-shifted transmission (7-speed for the V8s, 5-speed for V12s) is seamless and precise, and the power just keeps on coming. Yes, it's a bear to set up. Once it is, though, the COMAND system provides for a level of vehicle personalization and control that is as elegant as it is useful. It's an odd thing to love, but the glass in the CL-Class is treated to both reduce outside noise as well as keep radiant heat and UV rays from cooking the cabin. It's the best kind of obsessive German attention to detail. The interior of the 2013 Mercedes CL-Class is lavishly executed even though the design is not extravagant. The lines are sweeping and clean, the wood trim is rich and smartly applied, and the center console is wide to give a sense of space and comfort. Leather is everywhere, and immaculate. The 8-inch high-resolution display is well integrated into the dashboard and manages not to mar the elegance of the interior. Rear-seat legroom is only average, as expected in a coupe, but the seats are so good you shouldn't hear any complaints. Recent Mercedes design aesthetics are on full display in the shape of the 2013 CL-Class. The lines sweep back, long and clean, from the signature grille, and the pillarless-coupe greenhouse looks light and airy in contrast with the substantial visual mass of what is, in fact, quite a large car. The AMG versions of the CL coupes ratchet up the aggression with a wider-slotted grille and jowly air intakes up front. All models seem understated until you start examining their details. Well beyond well-equipped, every 2013 CL550 Coupe features 4Matic all-wheel drive along with Airmatic semi-active air suspension and a direct-steer system that varies the steering ratio according to how far you turn the wheel. The other CL models use Mercedes' Active Body Control, one of the few fully active suspension systems in production. Both AMG models give you biturbo-enhanced engines, AMG sport seats, AMG instrument clusters, sports pedals, and one impressively pretty analog dashboard clock. COMAND is standard along with nine airbags and heated/ventilated front seats. The 2013 CL550 Coupe has available packages offering a rearview camera, blind-spot assist, Active Lane-Keeping Assist, AMG-styled body pieces, and up to 20-inch wheels. The other CL-Class coupes offer few choices of extras beyond wheel designs, special paint and some interior features including the SplitView front entertainment system, which allows the driver and passenger to see two different programs on the same 8-inch high-resolution display, based on their angles of viewing. The special interior and exterior colors and finishes under the "designo" in-house personalization label are also available. The CL-Class engines are all happy monsters. The CL550 Coupe packs a 4.6-liter twin-turbo V8 good for 429 horsepower with a 0-60 mph time of less than 5.0 seconds. The CL600 Coupe gets a twin-turbo V12 rated at 510 horsepower. The CL63 AMG has a 536-horsepower biturbo V8, and the CL65 AMG a biturbo V12 with 621 horsepower and a gargantuan 738 lb-ft of torque. Those looking for something even more special can get an AMG Performance Package for the CL63 that boosts horsepower (to 563), torque and top speed. The V8s use 7-speed automatics, the V12s get 5-speeds, and the CL550 comes standard with 4Matic all-wheel drive. The 2013 Mercedes-Benz CL550 Coupe has a Manufacturer's Suggested Retail Price (MSRP) of $116,205 and the CL600 $161,205. The CL63 AMG carries a $153,905 sticker and the flagship CL65 AMG lists for $214,105. There are not a lot of extras to add: Sport, Driver Assist and Premium 2 packages can lift a CL550's price past $130,000, but there is barely $3,000 worth of trim variation on a CL65 AMG. Competitors for the CL-Class could include the Jaguar XKR and BMW 650i, though the CL550 runs tens of thousands more. Various Aston Martins, Bentleys and even Porsche 911s could also make the competitors list. 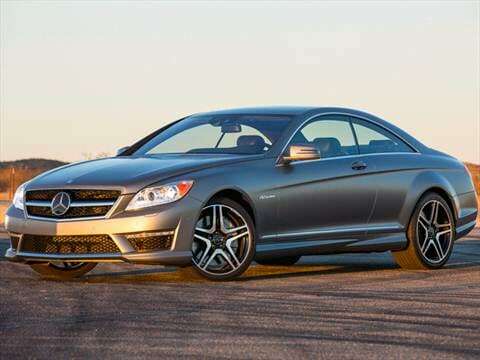 Check KBB.com's Fair Purchase Price to see what others in your area are paying for the 2013 Mercedes-Benz CL-Class coupes. We expect long-term value retention to be slightly better than that for a Jaguar XKR, but well short of a Porsche 911 Turbo or a BMW 650i.